A vegetation fire burning in near the center of Camp Pendleton has grown to 100 acres, according to tweets from the base. 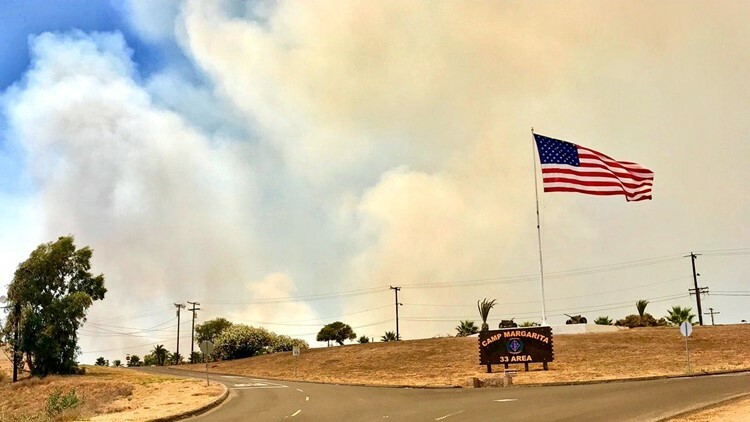 CAMP PENDLETON (CNS) - A brush fire that spread over about 1,000 open acres on the grounds of Camp Pendleton over the weekend was fully contained Monday. The blaze erupted late Sunday morning on a firing range in the center of the northern San Diego County military installation, according Marine Corps public affairs. By late afternoon, the flames had blackened more than 600 acres, authorities said. No structural damage or injuries were reported. The cause of the fire was unclear. Crews will patrol the burn area through the day to keep an eye out for any flare-ups, according to base officials.